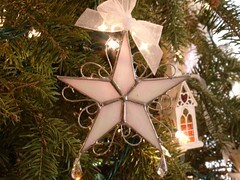 A dear friend of mine makes wonderful stained glass Christmas ornaments. We have her make a new ornament for each family in our church every year. This was last year’s edition. It sparkles so nicely with the tiny lights shining on the Austrian crystals! You can find her shop “The Glass Menagerie” here on Etsy.